Apple chief Tim Cook made a brief appearance on ABC's Good Morning America on Monday, discussing the company's participation in the White House's ConnectED educational program. 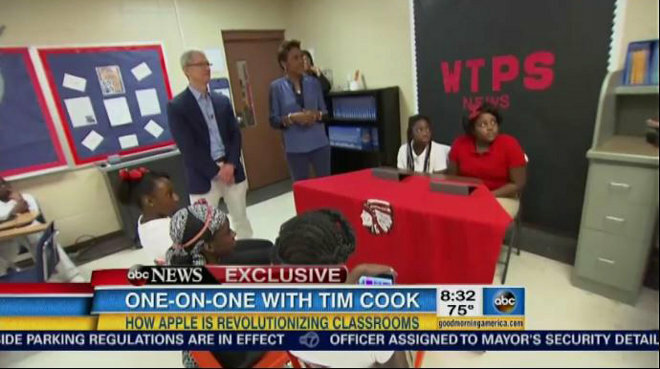 Cook talked about the program in a pre-recorded segment with show host Robin Roberts. The interview was set in an Alabama elementary school, and intercut with scenes of teachers and students using iPads to learn about the reconstruction period after the American Civil War, including shooting a mock newscast. Apple announced a $100 million contribution to ConnectED last fall, involving grants to 114 schools in 29 states. At each school students have been given iPads, while teachers and administrators are getting both MacBooks and iPads. Each classroom has been assigned an Apple TV. Cook did not reveal anything fundamentally new during the interview, but commented on things like Apple's attempts to bolster racial diversity, and how children are often surrounded by digital technology at home but step into an "analog" world when they come to school, leaving them disengaged. The ultimate goal of ConnectED is to link 99 percent of American students to high-speed Internet access by 2018. The Federal Communications Commission is working in tandem with a number of private corporations on the effort, some other parties including Microsoft, Sprint, and Verizon. Notably, ABC is owned by Disney, which has close ties with Apple. Disney CEO Bob Iger is on the Apple board of directors, and late Apple CEO Steve Jobs was Disney's largest individual shareholder thanks to Disney's acquisition of Pixar.